Welcome to Hollywood Premiere Party – The Show! Note – this is an immersive theatrical experience, not a traditional “sit and watch” play! Join the cast n celebrating the World Premiere of our fictional romantic comedy “Love and Waffles”. The ‘show’ is an immersive theatrical experience and we encourage all of our guests to move about the venue and enjoy all the evening has to offer! VIP tickets include reserved seats, while GA may find seating anywhere throughout the venue. Dining is “cocktail-style”…feel free to eat and drink wherever you may be at any given time! Cash bar is available. Thank you for joining us… hopefully you will leave with a new ‘agent’ or get a movie deal! Wheelchair access, street and paid lot parking. Lights, Camera, Action! Mingle with the “stars” at LA’s newest, interactive theater experience in the heart of Hollywood. Be a part of the A-List and witness the antics as you rub elbows with actors, directors and producers at this raucous and one-of-a-kind production. Opening Friday, October 7, guests are invited to attend the red carpet premiere party for Hollywood’s latest blockbuster, the romantic comedy “Love & Waffles”. Be a be part of the celebrity scene where “Tony & Tina’s Wedding” meets the Oscars. Hollywood Premiere Party is the ultimate Tinseltown experience, mixing humor, an immersive dinner and show and the “red carpet treatment” all in one memorable night on the town. 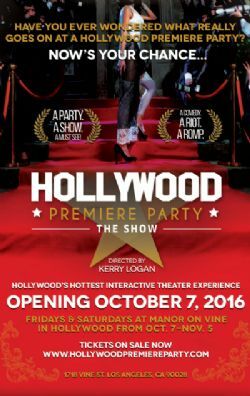 Running every Friday and Saturday from Oct. 7-Nov. 5, Hollywood Premiere Party is a show where everyone’s a celebrity. General Admission tickets are $50 or for $65, guests will receive the ultimate "ALL ACCESS" experience which include reserved seating, red carpet access during pre-show and photo opportunities with the cast and crew of “Love & Waffles.” Cash bar available.